Welcome to Wednesday Word, a weekly linkup for everyone, not just health and fitness bloggers. Each Wednesday you will have a single word prompt to write about. Let your imagination run free and share with your readers your interpretation of that word, or simply use it as inspiration for your post. 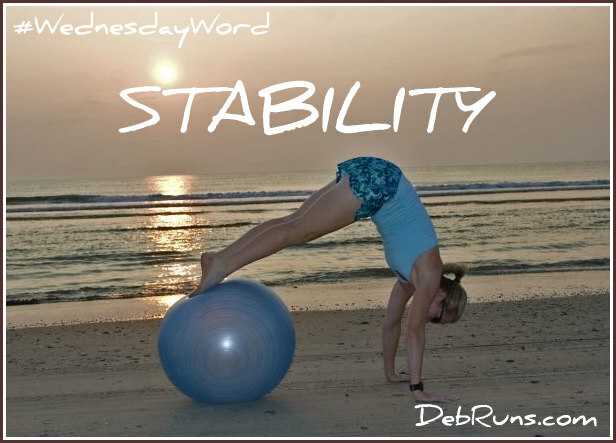 Today’s word is stability….. I’d love to have you link up, and if you do, please remember to follow my six simple rules. Stability is everything… Whether it’s structural, financial, marital, family, emotional, or core stability; without a strong foundation, things will eventually begin to collapse. I learned about the necessity of core stability when I participated in a 3-D gait analysis at George Mason University a couple of years ago. Until then, I assumed that my core (made up of muscles deep within my torso that attach to my spine and pelvis and aid in keeping me upright) was about as strong as it could get. After being put through a litany of tests by two GMU PhD students, it was determined that one of my areas of weakness is my core. I was actually quite surprised since strength training has been a consistent part of my overall training for over thirty years. Of course, in the early years I wasn’t focusing on core strength… Sure, I did crunches, used various ab machines, and a couple of different lower back machines; and I was strong, but my core wasn’t – my foundation was lacking stability. It seems like it was only about twelve years ago that I really started focusing on my core strength; however, I also assumed that my many miles spent running contributed to helping build a stronger core. In addition to my running, I’d end my strength training sessions with a few core exercises, but apparently not enough. In fact, when looking back I realize that as I got into the later miles of some of those long training runs and races, I’d start to slump forward with my core exhausted. Had I been focusing a little better on that aspect of my training back in my marathon heyday, I would have been a much stronger runner. 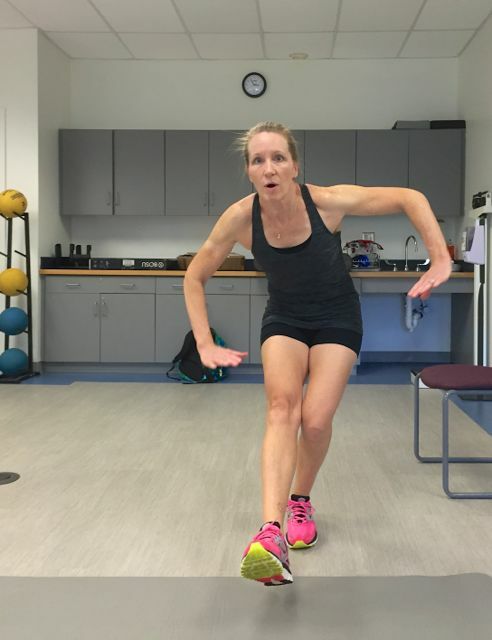 Once I completed my 3-D gait analysis and my results were broken down for me, it was recommended that I increase time spent on strengthening my core, and several exercises were recommended. I’ve seen a big improvement in my core stability since focusing on these key exercises. I don’t do all of the exercises every day, but try to mix them up in my routine at least three days a week. When sitting, I focus on core engagement, especially if I’m tired and would otherwise tend to slump. As a result, not only do I feel better, but I look better, too! 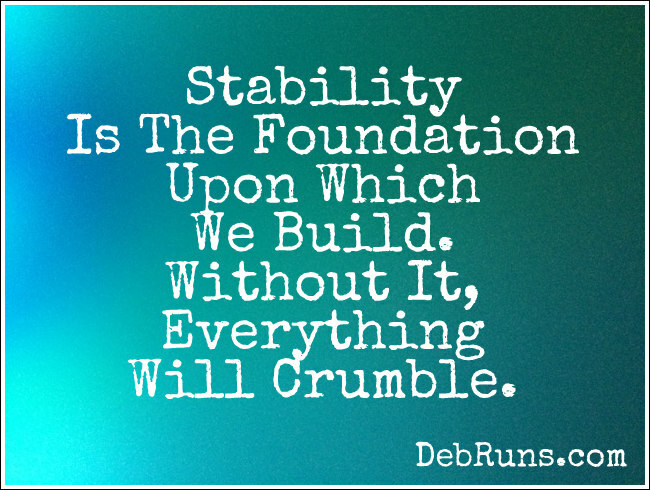 What part does stability play in your life? I learned the same lesson about my core after a nagging piriformis injury, You’ve got some tough exercises in your routine – I guess that’s how they make you stronger! Live and learn, right? I’ve learned that the core exercises that I do aren’t my favorite strength training exercises, but are probably the most important. Single leg squats are so hard! And posture is so important. And mine isn’t good. I’m constantly pulling myself up from slumping. That gait analysis must be fascinating! 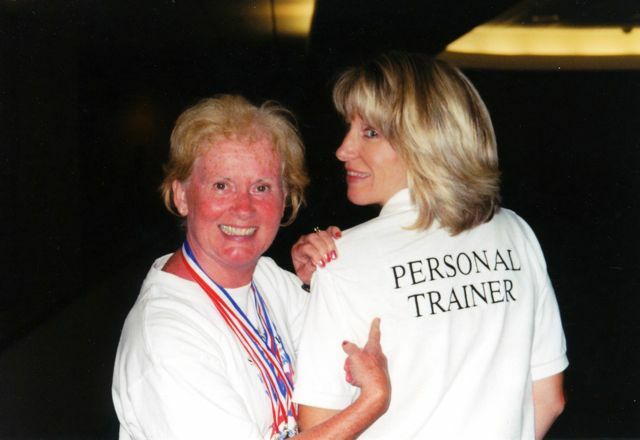 The gait analysis was fascinating, Judy; and it involved a lot more than I expected. I love core work! I have been doing a lot more of it (especially with all of my planking), and I can see an obvious difference….not only in definition, but in strength as well. I’d love to have another gait analysis. The only one I’ve had wasn’t that thorough, and the dude convinced me I needed to be in neutral shoes. (which, by the way, was such a “false positive” if ever there was). I know my gait is a little lop-sided because of my legs (both knees turn “inward,” one more than the other). I’ve often wondered if I should have an insert for just one shoe and not the other? Good for you for adding greater focus to you core. It’s so worth it, isn’t it? My coach is always working on core stuff with me. Those evil wheels she had me do last week were humbling. I think I’ve improved a ton in the core department but I’ve got a long way to go! Sounds like you have a great coach! I’m with you, and enjoy working my large muscle groups more than the fine core work; but we really need to do it! Even more than the running, I think that the core and strength work are what will matter the most to you in the long haul. Running is the “dessert” you get to enjoy because you’ve kept your body in good shape! When I was much younger a doc told me that it was important to strengthen my legs in order to run and I thought that was crazy! I was running in order TO strengthen my legs. Ahhh, foolish youth . . .
I’ve learned that stability is not constant. You really have to work hard to maintain it in all parts of your life. Oh I would love to do a test like that- but I know I don’t want to hear the results! Core work is SO important and I have really tried to up my game but I wonder is it ever enough??? I have a feeling that the older we get, the more it’s going to take to maintain our stability – at least that’s what I’m seeing so far. I know for a fact my core is so weak and unstable!! I am so bad at core work and stability!! I need to do better!! I just cant seem to stick with it! What is wrong with me!!! Oh I love that you had a gait analysis. I think I totally need to do this after rehabbing my current injury bc I feel like my stride has changed to compensate for my foot! My gait analysis was really interesting. You should definitely have one done if the opportunity arrises. I’ve been trying to incorporate core strength exercises (planks, push ups, etc.) into my routine at least twice a week during ultra training. For the most part I’ve met that goal, but I feel I have a lot of room for improvement. I think especially on trails core strength is really important when it comes to stability and staying on your feet! You’re exactly right about core strength being needed for trail running. I also think that trail running helps build core and stabilizer strength and makes us stronger for regular running.